Discovery College seeks to use digital technologies in powerful ways to enhance learning and teaching. We see digital technology as a natural tool in the learning process that supports and enhances the curriculum. We seek to allow students to use digital technologies as a creative tool to investigate, design, manipulate, programme, control, develop, create, publish, present, evaluate and reflect on learning to a variety of audiences both face-to-face and online. A teacher librarian and a digital literacy coordinator, as well as a range of technicians, support primary students and staff in class and in planning and developing units of work. Students in Year 1-5 access laptop and desktop computers provided by the College when required. Students in Year 6 and above use one to one computing and are required to buy a laptop computer and associated software in line with the current model being supported in the College. Further information regarding the visit DC Laptop Programme page. 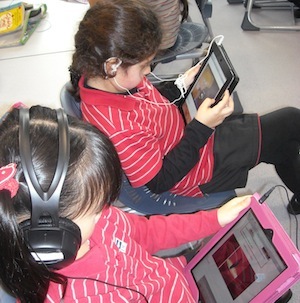 Students also have access to mobile devices such as; iPads, and iPod touches. Discovery College values the use of technology and encourages its use in creative ways to support student learning in a safe and secure learning environment. We provide infused learning opportunities related to online safety and security when using digital technologies. The school is committed to strengthen the partnership between home and school by offering presentations and workshops related to online safety and security.